Alabama has played an important role in many of the most significant events in U.S. history, from the period of territorial expansion, to the Civil War, to the civil rights movement of the 1950s and 1960s. 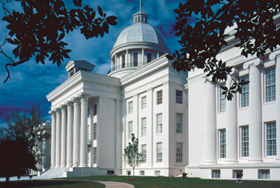 Throughout all these events and up to the present, Alabama’s governors have been at the helm, crafting policies and actions that created infrastructure and industry, expanded and curtailed civil rights, and increased and impeded access to public education. Each governor’s life is a reflection of the events actions, and ideals that shaped Alabama’s development and continues to do so today.